According to Sellar and Yeatman, authors of the alternative history of England “1066 and All That,” every time the English came close to solving the Irish Question the Irish bamboozled their colonial overlords by, cunningly, changing the Question. This neatly reflects the way England’s neighbors confound her. As in history so in soccer. The Scots and Irish and Welsh are quick to catalogue any example of overbearing English arrogance. The presumption, oft-relayed by the tabloids and TV pundits alike, that England are in some fashion owed a place amongst football’s elite is guaranteed to irritate even the keenest Anglophile. Readers who enjoy elephantine memories may recall The Sun’s EASY front page two years ago. England’s World Cup team was, we were assured, “The Best English Group Since The Beatles.” Aye, well, we know how that turned out. The parochial solipsism of the English press is unrivaled. So this tournament has been a curiosity: England arrived with unusually modest expectations. Even the tabloids have been quiet. No one expects Roy Hogdson’s squad to prevail. The key desire, I think, has been to avoid embarrassment. Thus far that has been achieved, even if a 1-1 draw with a decent French team—one that is still, nevertheless, scarcely worthy of being ranked with the greatest French sides—hardly merited the cheers it received. Because this is a Swedish paper it’s a grand joke. 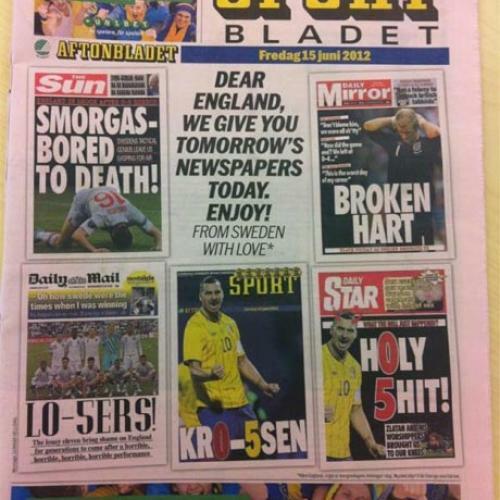 If it were an English paper mocking the Swedes we’d consider it the height of arrogance. Then again, that star on the English shirts is less a mark of honor than a permanent reminder that a lifetime has almost passed since England actually won the World Cup. Poor lambs.